Community® Coffee Hits the Road for Summer Adventures. We want YOU to take us there! What do I love about coffee? Every single thing. What do I dislike about coffee? The horrid, nameless, tasteless coffee I find in hotels and motels across the country. Imagine, if you will, my utter joy in discovering that Community Coffee is now offering Community Coffee To Go! Yes... Community Coffee has 1 oz. (4 cup) packages to take with you on your travels! Community Coffee Travel Packs – The 4 cup travel packs, perfect for most hotel coffee makers, are available in Café Special®, Dark Roast, Medium Roast and Decaffeinated. Made with 100% Arabica premium and specialty coffee beans. Ah... bliss... A trusted and loved coffee that goes with me wherever I go in individual packages! No spilled grounds... no mess... and no trying to guess what it is I'm drinking in the morning! I'm also quite partial to the Cafe Special. 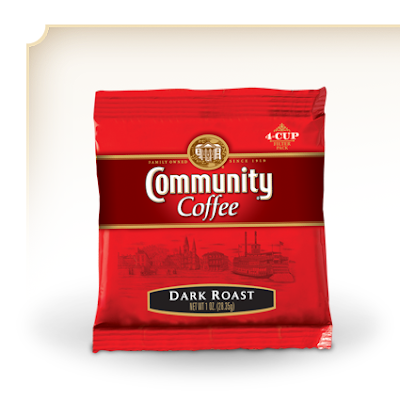 Although, ALL of Community Coffee's blends are wonderful. Those of us who love Community Coffee understand well the name of the Company. Once you've tried it -- you do become part of the family. We are loyal. And the company is loyal to us! Community Coffee Company has sold the finest fresh-roasted premium coffee in Louisiana since Henry Norman “Cap” Saurage began selling coffee out of his country store in 1919. Today, Community® coffee can be found in grocery and convenience stores, offices, hotels and some of the best restaurants throughout the South. It is also served daily at CC’s Community Coffee House® locations in Baton Rouge, Lafayette and New Orleans, and is available worldwide through CommunityCoffee.com. Community Coffee Company is the largest family owned and operated retail coffee brand in America. If you'd like to enter for your chance to win a fabulous Community Coffee To Go Travel Pack (2 Travel Packs each of Dark, Medium, Decaf, and Cafe Special), just follow the instructions below! MANDATORY ENTRY: Please share a special Travel Memory with me! 1. "LIKE" (Fan) Community Coffee on Facebook. 3. Tell me another Community Coffee flavour you'd like to try! 11. Grab my button and post it to your sidebar or favourites page! This contest will be open from Tuesday, July 5th until Thursday, July 14th. Winner will be announced on Friday, July 15th. Disclosure: I was provided with a complementary Community Coffee To-Go Pack for the purpose of this review and giveaway. I received no other compensation. My opinion is based solely on my own experience and use of the items reviewed. I love their Cinnamon Roll flavored coffee!! I won a Caribbean Cruise from Tropicana and got to take my sweetheart for a free vacation. That was awesome!! I entered your Country Bobs All-Purpose Sauce Giveaway! Here's my special travel memory. Whenever we have a very long drive, we start driving very early - at 4 AM. That's a time anyone could use some great coffee! Another one of their coffees that I'd like to try is their Pecan Praline! I also follow your daughter's blog Once Upon a Product Review. I follow OOAPR via GFC: allibrary.